The ideal pet bird is going to be both tame and trusting. If you want your pet bird to let you touch his stomach, he will have to learn to completely trust you and accept your attempts to handle him without question. The good news is that most pet birds can be taught to accept your touch all over their bodies. Start off by holding your bird in your hand. He should stand on your hand willingly and be accepting of your touch. If he isn't, you'll have to spend time taming your bird to accept being touched by you. You tame a bird by spending time each day handling him, gradually getting him used to being touched and interacting with you. You should reward his progress with a treat when he does what you want him to. Once your bird will stand on your hand and accept your petting, start touching his belly by gently running your finger down his body and across his stomach. If he accepts the touch, give him a treat. If not, try again and again until he allows you to pet his stomach. It's in your bird's best interest if you can handle him all over his body. 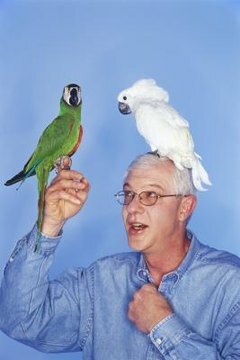 Being able to handle and touch your bird from the top of his head to the tips of his tail feathers will allow you to completely check him for signs of illness or injury. The more accepting your bird is of your touch, the more likely it is that you'll be able to catch potential problems in their earliest stages. It's easiest to tame your bird when he's still very young. The easiest birds to tame are those that have been hand-raised by their breeders. If your bird is used to being handled, teaching him to allow you to pet his belly will simply be a matter of desensitizing him to your touch on those sensitive areas. Also remember that some types of birds are much easier to handle than others. You will probably have much better luck teaching a parrot how to accept your rubbing his belly than you will a less intelligent, less social bird. It can take a significant amount of time to gain a bird's trust, especially if your bird was not tamed when he was young. Don't ever get frustrated or angry when you are trying to teach your bird to let you pet his belly, even if he isn't being cooperative. Kindness and consistent handling are key to eventually teaching your bird that a belly rub can feel good. Is There Any Way to Calm Down a Bearded Dragon?